You might not believe it but I’m trying to master the art of travelling light and shoes, knickers and opaque tights aside, it’s not going badly. The last couple of months (as many of you already know) have been a bit mental and so I’ve been out a lot, staying with friends and generally not going home (minds out of gutters, I WISH) so my beauty bag has been considerably condensed. I’ve got a mini foundation from my Prescriptives Custom Blend set, Touche Eclat and It Stick concealers hardly take up any room and Clinique’s Lash Power mascara is both portable and handy to have around as you don’t need make up remover to take it off. My main issue is always with eyes. I love my eye make up and hate being restricted but I understand some handbags can’t facilitate my A5 sized Stila palette… Boo to them. But they’re so pretty… Sorry, I get distracted. 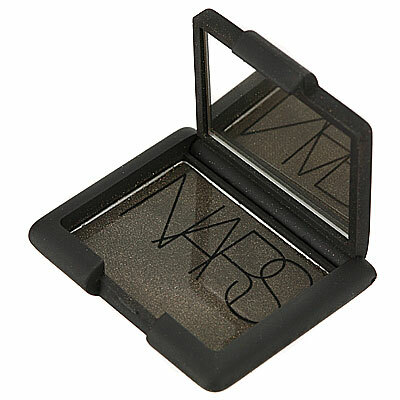 Luckily I’ve found a compromise in two lovely Nars shadows – Heart of Glass, an icy white/blue with shimmer and Night Clubbing, black with gold pearl. They feel like silk, never crease, last forever and they can be used alone for a wash of sparkly colour (Heart of Glass) or an intense punch of rock chick/chicky rock (Night Clubbing) or blended together for a super cool smokey eye. I’ve also found Heart of Glass to be the perfect hangover shadow as it lights up the whole eye area and the blue in it takes away some of the redness in tired eyes. And it’s called Heart of Glass – could it be any cooler? Plus, you know, they’re Nars and therefore delicious and beautiful. Yum, tactile rubberised casing. Hurrah, decent sized mirror in the case. Ha, jealous people on the train. Boo, being so hungover you stick your fingernail in the shadow instead of opening it carefully.